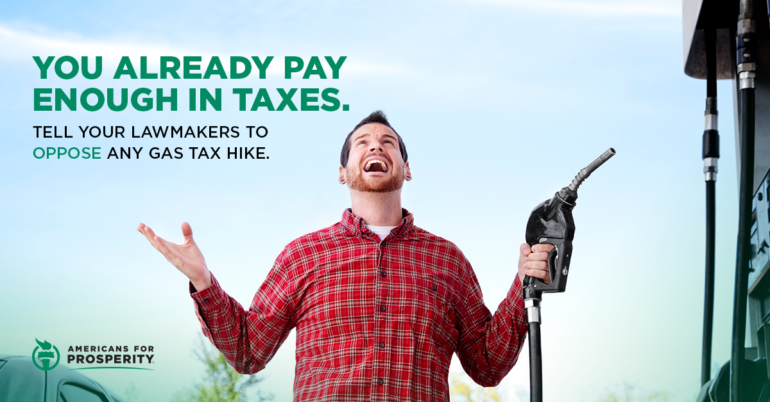 Arlington, VA – Americans for Prosperity (AFP) today launched a six-figure campaign advocating solutions for improving America’s infrastructure without imposing new burdens on consumers through a 25-cent per gallon gas tax hike, which would impact virtually every aspect of the economy. Coinciding with the launch of the campaign, AFP and Freedom Partners Chamber of Commerce is also releasing an updated state-by-state analysis of the real-life consequences that such a tax increase would have on people across the country. According to the analysis, households across all fifty states would face hundreds of dollars in higher taxes at the gas pump. Notably, households in states like Wyoming, Texas, South Dakota, South Carolina, and Mississippi could see a new tax burden ranging on-average from $350 to $390 per year. Furthermore, the total state and federal tax burden would climb to over $1.00 per gallon in Pennsylvania, 96-cents in California, 92-cents in Washington, 87-cents in Hawaii, and 87-cents in New York. AFP has long maintained that there are better ways to address our nation’s infrastructure challenges than asking Americans to reach back into their pockets to funnel more money into a broken system. The economy is booming in large part due to the tax and regulatory reforms that Congress and the administration have implemented, and we urge them not to undermine that success by clawing back that tax relief at the gas pump.